Atmospheric particles with long atmospheric lifetimes affect Earth's radiative balance. These particles typically consist of multiple chemical species. The tendency for these particles to scatter and/or absorb radiation depends on their internal structure and composition as well as their overall size and shape. In this work, selected urban ambient air particles were investigated using microbeam techniques. Focused ion-beam milling produced cross sections of individual particles from which the particles' internal structure was observed by scanning electron microscopy (SEM). Elemental composition of the particles' interior was mapped by energy-dispersive spectroscopy (EDS). SEM images and EDS maps were then used to investigate particle internal structure and composition. Two-dimensional SEM image (a) and elemental maps (b, c) of carbonaceous particle with Ba and Ca inclusions. Due to the complexity of how solar energy interacts with atmospheric particles, large uncertainties exist in predictions of the effect of aerosols on climate. A critical component in reducing the these uncertainties is the accurate determination of the particle single-scattering albedo, defined as the ratio of light scattering efficiency to total extinction (absorption+scattering) efficiency. Since atmospheric particles often consist of multiple chemical species and phases, scattering and absorption properties depend on the particles' internal structure and composition as well as overall size and shape. This project employed microbeam methods to demonstrate how particles with the same "bulk" chemical composition might have different configurations with respect to particle inclusions. The investigation will lead to a better assessment of variability in absorption and scattering efficiencies due to the configuration of inclusions, and therefore, lead to better estimates of uncertainties in climate forcing by aerosols. Models of idealized particles consisting of highly-absorbing and highly-scattering components have demonstrated how absorption efficiency might vary for different configurations of the components (e.g., Fuller, K.A. et al., J. Geophys. Res., 104, 15941-15954, 1999). The objective of the current work is to investigate the internal structure and composition of real atmospheric particles to show how variability in absorption and scattering efficiencies of real particles would compare with models for idealized particles. The goals of this project are 1) to demonstrate the use of microbeam methods for investigating the interior of individual atmospheric particles, and 2) to provide real-particle analysis that will lead to better estimates of uncertainties in optical properties for various types, sizes, and shapes of particles. The focused gallium-ion beam in a dual-beam (electron/ion) microscope was used to mill selected particles to acquire a series of cross sections for each particle. The electron beam was then used to generate a secondary electron image for each cross section. Energy-dispersive x-ray spectroscopy was used to map the elements in each cross section. 3D imaging software is used to provide a reconstruction of the composition of each particle based on the x-ray maps and secondary electron images. Selected particles included fine-mode (<2.5 μm) and coarse-mode (2.5 μm to 10 μm) particles from urban sites in Atlanta, Los Angeles, and Seattle collected during late summer, late fall, and late winter, respectively. Figure 1 shows a 2D analysis of a carbonaceous particle with calcium and barium inclusions. The element maps (b, c) suggest that only a few Ca and Ba inclusions exist in the particle. The Ba phase may be a sulfide (1) or sulfur oxide (2). While the Ca phase (3) appears to be an oxide, some Ca does not match with O. Figure 2 shows cross sections of the same particle. In contrast to the Fig. 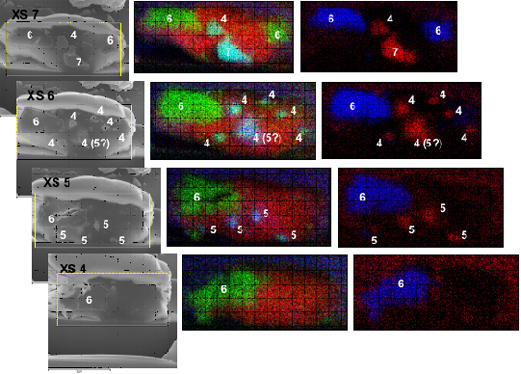 1 maps, cross-sectional maps reveal numerous Ba inclusions that are both embedded and peripheral. Cross-sectional maps distinguish the Ba sulfur oxides (4) from Ba sulfides (5). The large Ba inclusion (7) is peripheral, but within the particle. Ca inclusions are clearly oxides (6,8). Figure 2. 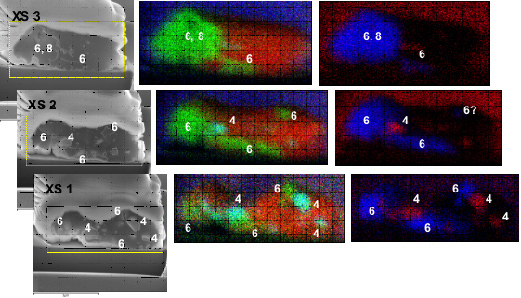 Secondary electron images (a) and elemental maps (b) C(red), O (green), S (blue) Maps, c) Ba (red), Ca (blue) maps of particle cross sections (xs).